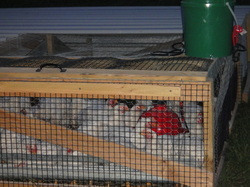 October 2013 marks our first attempt with pasture-raising chicken for meat. These chicks were fed non-GMO, natural, local feed, plus lots of pasture/bugs for most of their short, but happy, and productive life. Their pens are on grass and starting at 4 weeks, they are raised on pasture until the end. We move their pens twice a day for fresh ground. Spring 2014 we decided to try raising Freedom Rangers, a more natural type of chicken, but taking longer to raise to full size. Forages more than previous Cornish rocks. Price: $4.50/lb. We are currently sold out and don't always do broiler chickens. Occasionally we have old stewing hens (old layers) for sale at $3/lb. They produce the richest and tastiest stock ever.